Rooms: with bathrooms. Room is equipped with: wireless Internet access (Wi-Fi), TV, radio. Some rooms: with balconies. At guests' disposal: fridge, ironing board, cordless kettle. We perfectly organize occasional parties, wedding receptions. Number of places in room: 30. Open: from 11.00 to 21.00. We perfectly organize: occasional parties. We organize outdoor events for 50 persons. 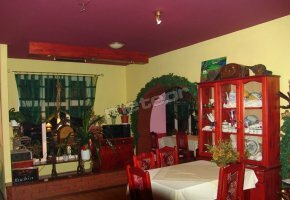 We specialize in the following cuisines: regional cuisine, Italian cuisine. We offer rich menu. Open: from Monday to Friday 12.00-18.00, Saturday 12.00-18.00. We offer bar dishes. We specialize in the following cuisines home cuisine. Rooms with bathrooms. Rooms are equipped with: balcony, cable television. On the premises closed parking. We offer ability to buy full board: breakfasts, dinners, suppers. At disposal drink bar. We believe that our offer meets your expectations.